The day started out as my weekdays normally do. The awareness that I am awake – no longer in that safe sleep place – like razors in my brain. Every cell screams, “I DON’T WANT TO GET UP!” My Beautiful Man (that’s “husband” for those who need clarification) brings me a cup of coffee, sing-songing his refrain, “Wake up juice…Juice, wake up!” And, I groan and smile up at him as I force my eyes to open, forcing myself to face the morning, however benign or hostile it may be. “God, help me…again”, I breathe. My Beautiful Man sits with me and holds me for too short a time (forever would be too short a time) before he must go to work. But, because he shows such selfless love for me in getting up early to get the kids ready before he wakes me, I am helped beyond measure. I would not be able to do any of this without him. He goes. And, it begins. Oh, how I love them, but sometimes I cannot stand them. If you are an honest parent you will be identifying with me right now. If you are a self-righteous parent you will be condemning me right now. Go read another blog. I ain’t sugar-coating anything today. They whine, they fight with each other, they throw ear-splitting and heart-crushing tantrums. Some days are better than others. Today, however, was not one of the good ones. We are late on our school run and by the time we have made it there and I have dropped them off, I am feeling demoralized and defeated. There are days when I would be sobbing by this point. I would stumble home in floods of tears and incoherent sorrow-filled moans to sit in a corner, hiding – or trying to hide – from it all. Those are my bad days. Depression is a funny old beast (ironically enough). Fortunately, I do have days – like this one – when I am naturally emotionally detached. The stressors come and instead of dissolving in a puddle, as I might do in a day or two, I kind of shrug and grunt and shift to “somewhere else”. There will be people who understand this. If you don’t, don’t worry about it. Just keep reading. I am taking you somewhere, I promise. Upon walking home, I realised the mildness of the day. Very mild for this time of year. I decided to go for a walk down by the canal because I simply didn’t want to be sitting, stagnant, indoors yet. As I began my walk, I was simply going through the motions, one foot in front of the other, automatically, robotically. 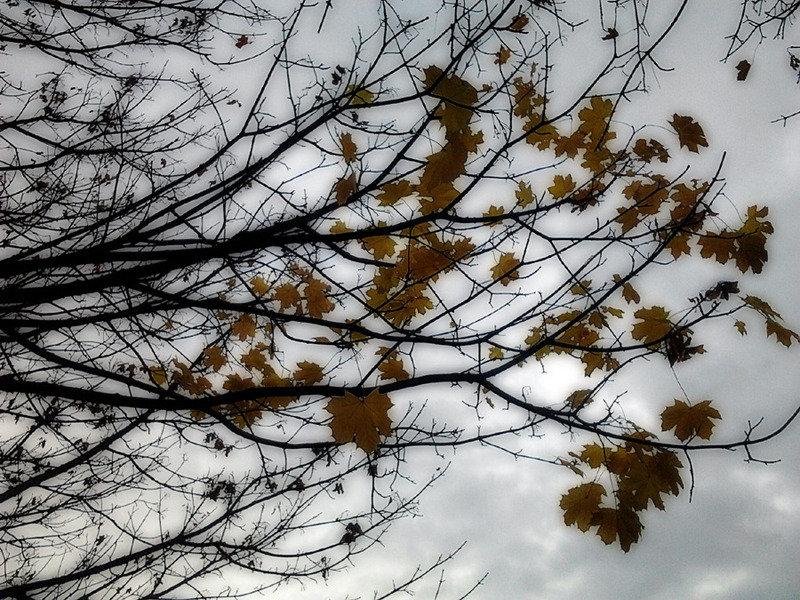 Then, the shape and colour of the leaves began to catch my attention and I stopped to look. My eyes had been open the whole time, of course, but now I was seeing. Colour and texture. Beauty. Many ducks and swans were upon the water, taking their morning constitutional. And, I walked along with them as they swam, enjoying the freedom of movement in the fresh air. I sensed God’s nearness: the glory and beauty of this mild autumnal day testifying to His glory and beauty. I said “Thank You” and spent time praying for eyes that really see and freedom from the dullness that can so easily happen in the day-in/day-out mundaneness of life and responsibility. God met with me there, by the canal, and we fellowshipped. I felt like I had begun the day again. Fresh. His mercies are new (see Lamentations 3:22-23). Without even thinking about it, I started to sing my song “Gloriously Autumnal” – singing it for myself. I mean, I wrote it for myself when I wrote it. But, once you write – and then, subsequently, record – a song, it takes on a life of its own. It’s no longer soley yours. But, in this moment, the song was privately and intimately mine again, as much so as the day the words and melody poured so passionately forth from me to the paper. I experienced a grace-moment, and I was “carried away”, just as the song says.